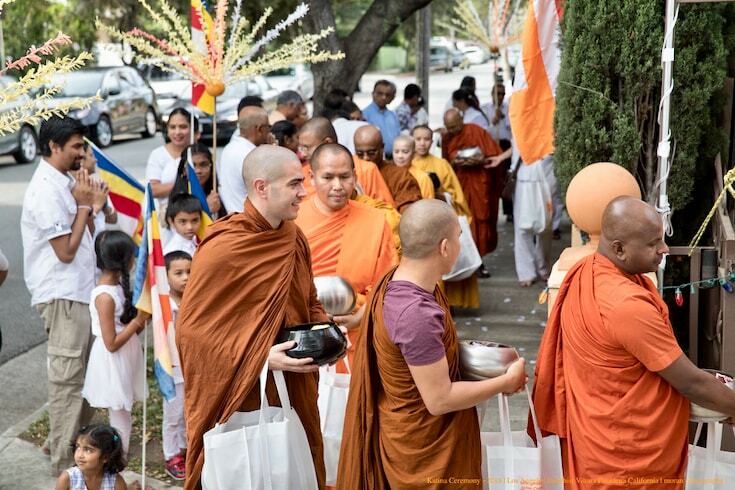 Sanathavihari Bhante Bhikku (left foreground), a Mexican American monk who teaches in Spanish, on alms rounds outside Los Angeles Buddhist Vihara in Pasadena. 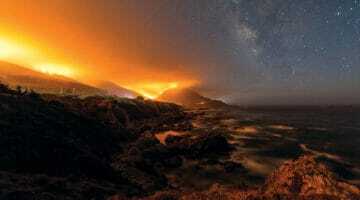 Photo by Moran Perera. When Ven. 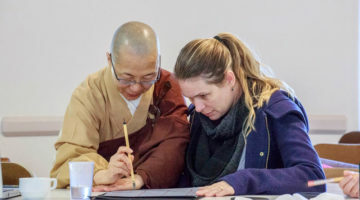 Dhammadipa Konin Cardenas started teaching Buddhism after her ordination more than a decade ago, she realized an important contribution she could make: She could teach in Spanish. After leading zazen instruction and book groups in Spanish, Cardenas, who is Colombian American, has just finished teaching the San Francisco Zen Center’s first online dharma class in Spanish, Imágenes del Ser, or Images of the Self. Cardenas’ class is one example of the new ways Buddhist leaders, temples, and organizations are reaching out to Latinx practitioners, which the Pew Research Center has reported account for 12 percent of American Buddhists. While it remains unclear how much Buddhism is growing in the Latinx community, many leaders are seeing opportunities to make inroads among Spanish-speaking audiences. 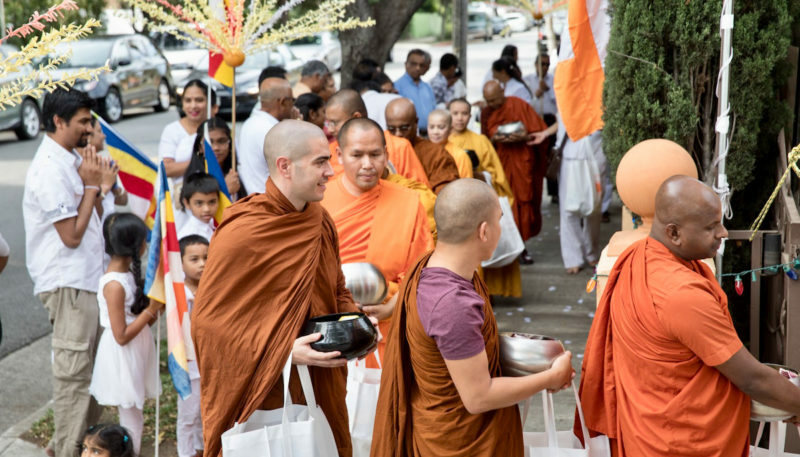 “The potential is incredible,” said Sanathavihari Bhante Bhikku, a Mexican American monk at the Sarathchandra Buddhist Center in Los Angeles. Soka Gakkai International, one of the largest Buddhist institutions in the U.S., is one of the pioneers of Buddhist outreach to Latinxs. Since 2001, the group has hosted annual Spanish-language conferences, which offer an opportunity to learn about Nichiren Buddhism and for longtime practitioners to build community with each other. When I experience the dhamma in Spanish, it strikes me differently, and sometimes in very beautiful ways. “One of the key points in spreading Buddhism for the future is to be able to express it in one’s own language,” said Harry Monteagudo, a Cuban American who serves as one of the coordinators for Soka Gakkai International USA’s Spanish language group. Nearly 200 people attended this year’s event, he said, including many young second-generation Latinx Buddhists who, unlike their parents, are growing up with the practice. A growing number of Buddhist groups are making similar efforts. Cardenas’ class at the San Francisco Zen Center is based on Shunryu Suzuki’s book Zen Mind, Beginner’s Mind — which she said is one of the few books on Buddhism that has been translated into Spanish — and includes pre-recorded lectures and live discussions. Fifteen students are enrolled in the class, and about a third are from Mexico. Even for Latinxs who are fluent in English, she said it’s important for them to be able to experience the teachings in their native tongue. The spread of Buddhism is already changing the broader Latinx community, said Bhante of the Sarathchandra Buddhist Center in Los Angeles. Three years ago, Bhante launched the YouTube channel Monje en la Modernidad, or “Monk in Modernity,” where he posts lectures and interviews in Spanish. He also hosts live online study classes and meditation sessions. These digital platforms, he said, are key to reaching an audience that’s dispersed around the globe and may not have other ways of getting information about Buddhism. In addition, Bhante also hosted a meditation retreat in the Mexican state of Zacatecas this year and has been working on translating sutras and modern Buddhist books so that Spanish-speakers can have access to more Buddhist source texts. While technology has solved many problems, it hasn’t erased them all. Accurate translations are still one of the biggest challenges for Spanish speakers interested in Buddhism, he said. And, even for English speakers, it can be difficult to find a temple to join, since many of them operate in Asian languages such as Mandarin or Korean. Zen and meditation centers that cater to American Buddhist converts aren’t always a fit either. Marcia Taborga, a Bolivian American member of the Orange County Buddhist Church in Anaheim, said when she started looking for a temple five years ago, she wasn’t interested in meditation centers because they lacked a cohesive community. And as a mother of two, she and her husband needed a place to practice with their young children. “In practice, in real life, I feel like you need community,” she said. 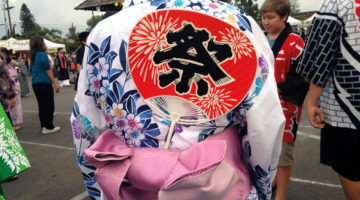 OCBC — a Shin Buddhist temple founded by Japanese immigrants in Southern California more than 80 years ago — appealed to her instead because of its combination of English-language services (the temple is now run primarily by second- and third-generation Japanese Americans) and family-friendly programs, such as weekend dharma school for children. Taborga is now part of the temple’s hospitality committee, book group, and adult study class, and is an advisor to her children’s Dharma wheel club. The temple — and Buddhism in general — also offers a more inclusive community than what she had found in the Catholicism of her upbringing, she said, which is one reason many Latinxs are searching for new forms of spirituality. This desire for community, Cardenas said, is one way the Latinxs are shaping American Buddhism. Based on her experience teaching, she said that Latinxs place a higher value on community and intimacy with outer practitioners. Spanish speakers usually share more of their personal lives in an effort to build community with other students, she said, whereas most English speakers seem to be more focused on their independent practice. “It’s taking our sangha closer to the heart of Buddhist practice,” she said. Caitlin Yoshiko Kandil is an award-winning reporter based in Southern California and a graduate of Harvard Divinity School.